The film “Hope for Belize’s Hicatee” was released online and in classrooms across Belize on October 2, 2017. This 16-minute documentary describes the natural history of Belize’s only critically endangered animal, the hicatee turtle, Dermatemys mawii. The film shows the turtle’s current status across its range, discusses its rapid decline and details some of the current efforts to preserve the species and prevent its extinction. 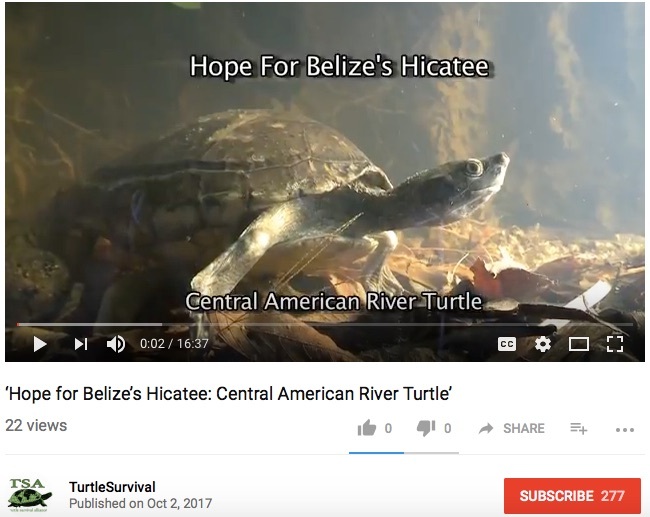 A project of the Turtle Survival Alliance, “Hope for Belize’s Hicatee” was directed and produced by Richard and Carol Foster of Wildlife Film Productions with logistical support from the Belize Foundation for Research & Environmental Education (BFREE). This film was made possible through the generous support of the Columbus Zoo and Aquarium Conservation Fund. Distribution of the film was funded by the Turtle Conservation Fund.